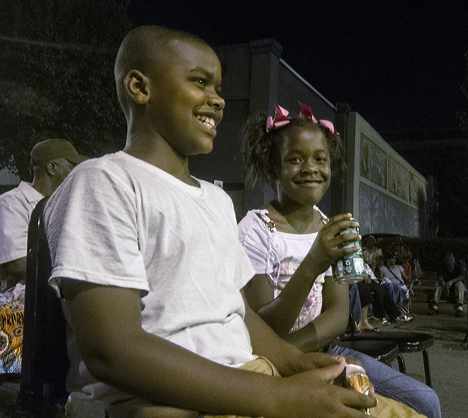 A giant feline and a petite girl greet admirers with a smile from their perch in the bed of a pickup truck in the first ever Ding Dong Days – Homecoming Parade in Dumas, Arkansas. The people in the cab are having a large time as well. Prior to this, the two events were months apart and not related. Click the big critter to see more pictures and the start of this story on Corndancer dot com. September 27, 2013 was a first for Dumas, Arkansas. The good folks of the city saw good reason to combine their 33-year-old festival, Ding Dong Days, with their local high school homecoming. It was not a snap decision. It took some head-scratching and soul-searching to reach the decision point. After all, they were messing with some deeply entrenched traditions. With the guiding idea of exploring new options, Dumas people got their heads together for open and informed discussions. As a result, they developed a plan and in less than 12 months, the people of this Delta city hatched up a new combined event that worked like a charm. You can get more details of how this worked and see more event pictures on the Photo of the Week page at Corndancer dot-com. The original Ding Dong Days festival started in 1980 the last week of July to coincide with the original incorporation of the city. After a few years, some dear hearts in the city began to question the importance the date tradition versus the oven-like heat of late July in the Delta. Most of us down here believe that’s a good time to stay indoors and let the AC do its trick. In case you wondered, The Ding Dong Days name came from a popular song from the 1920s, Ding Dong Daddy From Dumas. The song was popular in the Dumas area. 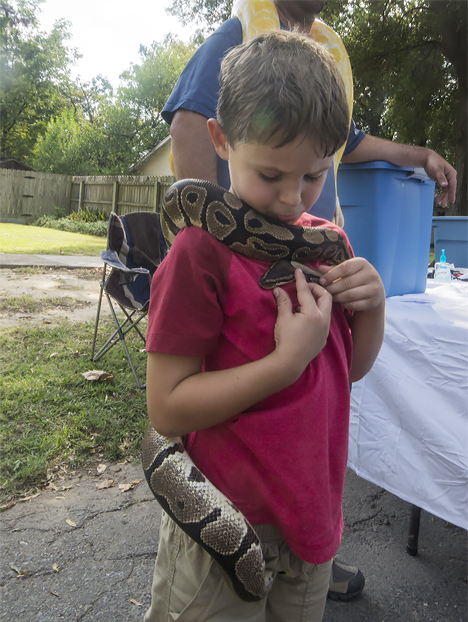 The Snake Den from McGehee, Arkansas brought a display of non-poisonous and tamed snakes for touchy-feely — for three bucks. 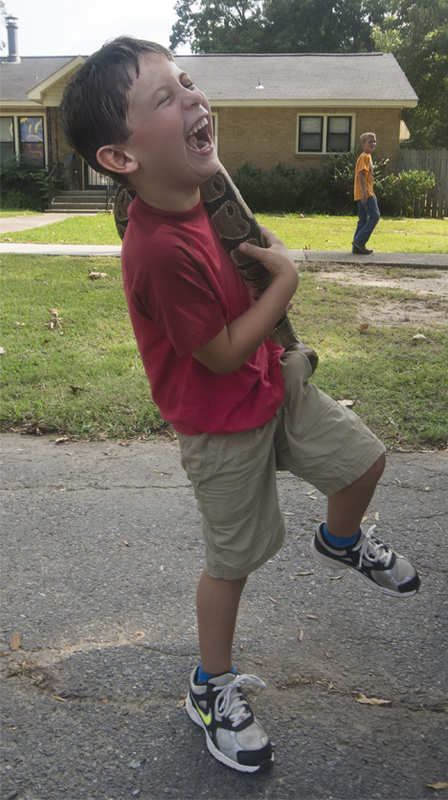 Here, young Drake Norris, having paid his dues, meets up with his new serpentine friend. Drake and snake were having a good time, much to the delight of their growing audience. Then the snake stuck his head in Drake’s pants pocket and that brought the house down. The fear of snakes was replaced with boisterous laughter. Such a deal. 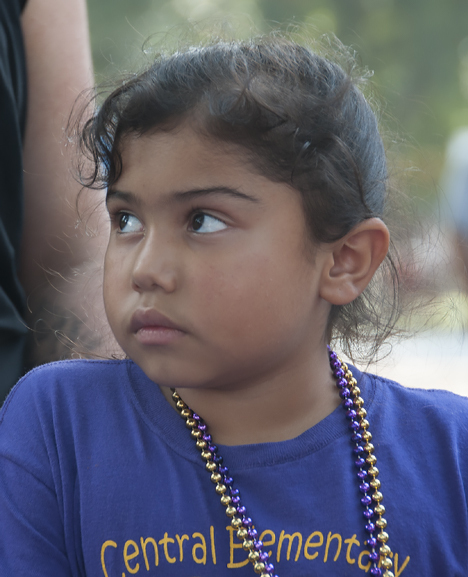 This little girl seems to be quietly curious and amazed by it all. 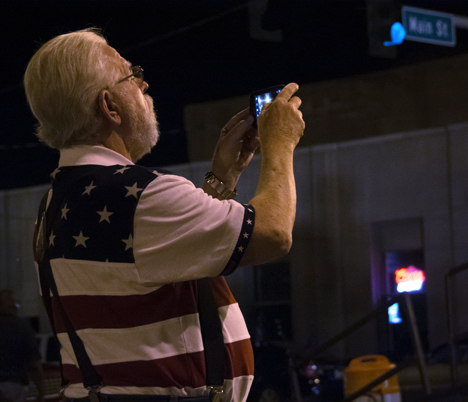 What the good folks in Dumas did was breathe new life into two of the biggest events in the city. In so doing, people who were nodding acquaintances at best got their heads together on a regular basis, got to know each other better, and built a strong foundation of working together for a common goal. My friends, if I am not mistaken, that is the real America. 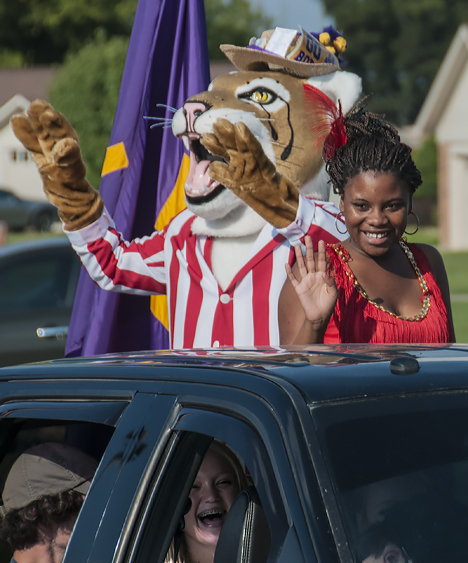 See our 83 picture gallery of these Ding Dong Home Coming events. More parade. More people. More snakes. Click here. 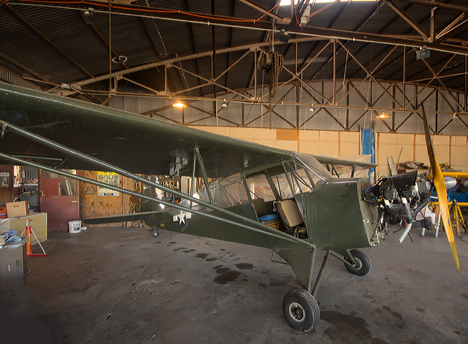 The Razorback Chapter of the Experimental Aircraft Association at Grider Field in Pine Bluff, Arkansas restored this Fairchild PT-19 World War II training aircraft to flying condition. There was a method in their madness. Grider Field was a pilot training facility in World War II. The PT-19 was the plane used for pilot training. By their actions, the members created historical value for the community and added one more plane to the national inventory of restored WWII aircraft. The plane here is on display during the organization’s annual Wings and Wheels Fly-in and Car Show, September 20, 2013. If you are into airplanes, old and new, and cars of the same breeds, Grider Field, the Pine Bluff, Arkansas municipal airport was the place to be September 2013. The Razorback Chapter of the Experimental Aircraft Association, headquartered at Grider Field rolled out their impressive collection of experimental and World War II aircraft for all the world to see up close and personal for their Annual Wings and Wheels Fly-in and Car Show. They invited a local car club to bring their custom vehicles which were equally impressive. Click on the formation to see the original picture, story and more pix. One of the cool parts of any air show is seeing pilots show off. They love it and you love it. In this case, a local group, The MID SOUTH RV-ATORS, all builder-pilots of their own RV performance aircraft put on a fine show of formation flying. The show was complete with trailing smoke and the hair-raising throb of reciprocal aircraft engines whizzing buy at altitudes low enough to get the decibels you love to hear. You can see one of the formations and other pictures from the event on the Photo of the Week page at Corndancer dot-com, where this story started. We’ll wait here while you look. 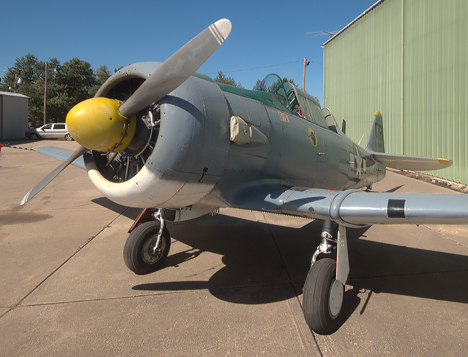 You are eyeball to eyeball with a finely restored North American AT-6, World War II era advanced trainer, one of the restored aircraft owned and maintained by Razorback EAA Chapter members. 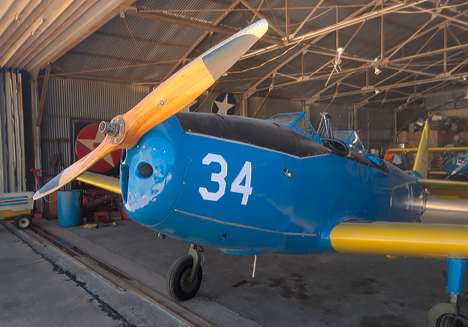 This plane was the last trainer fledgling pilots would fly before taking the controls of combat aircraft. Side view of North American AT-6. Unlike many trainers of the WW II era, this aircraft was sturdily built and saw service in many foreign air services as a fully-armed combat aircraft. This is the business end of a World War II Aeronca L3B. The light plane was used for observation and we presume, occasional VIP transportation. We are fortunate that the engine cowling was removed for this display. The four-cylinder engine required 73-octane gas, high-performance juice in those days. Aeronca L3B side view. Lots of visibility and precious little bullet-proofing material. This little bird was a legendary performer. The recommended cargo limit was ten pounds. It has a 12-gallon gas tank. 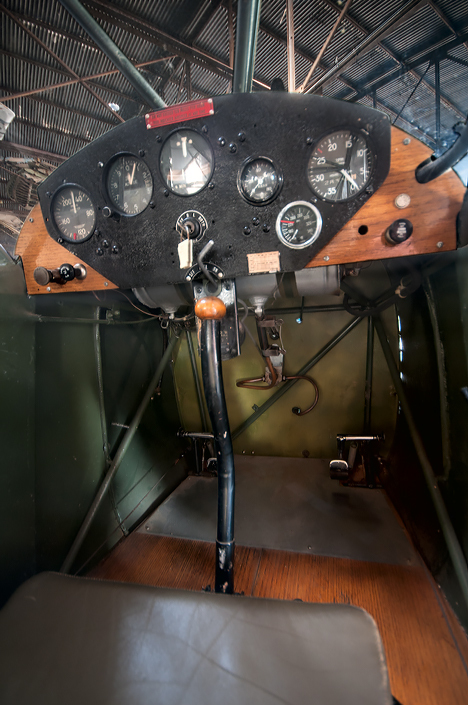 This is the pilot’s compartment in the L3B. The basics are there and the gas tank is just above your knees. This is aircraft 101a. While some bodily contortion was required to capture this image, no photographers were injured. 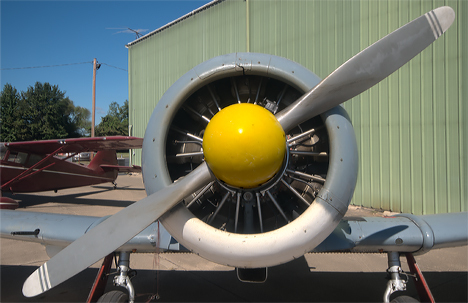 Pratt and Whitney radial engines are legendary for their quality, sturdiness, and longevity. 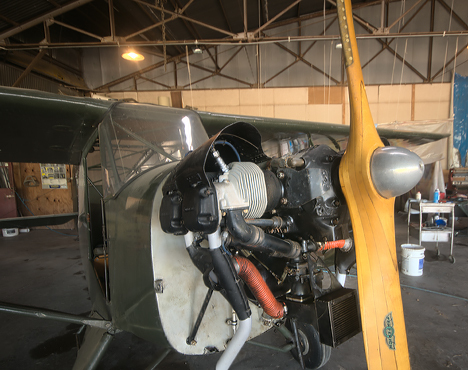 The engine you see below is a nine-cylinder Pratt and Whitney Wasp attached to a Vultee BT-13 undergoing maintenance. The engine is OK, the gas tanks on the plane are getting the fix. I have been flown for an aerial photography session in this aircraft. See a view from the cockpit and a view in the cockpit from that trip. 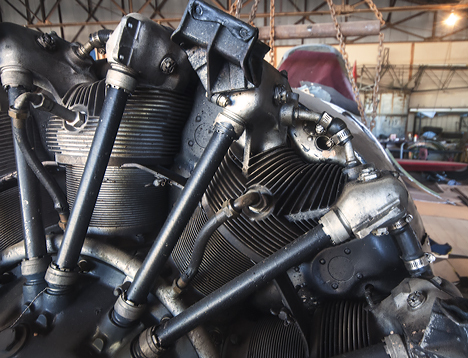 You see two of the nine cylinders which make this 450 horsepower Pratt and Whitney wasp twirl. When this big boy cranks up, the neighbors know it. 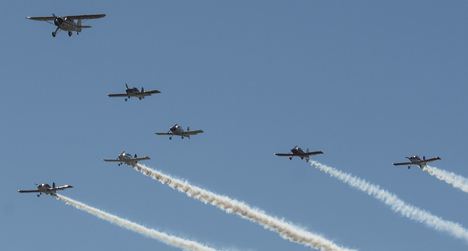 The MIDSOUSTH RV-ATORS led by a restored 1943 Howard DGA-15 do one of many formation flyovers during the show. A couple of guys are inspecting a thirties era “hot-rod” Ford truck. The vehicle was for sale, but apparently the yellow beauty was not tempting enough to bring out any checkbooks. 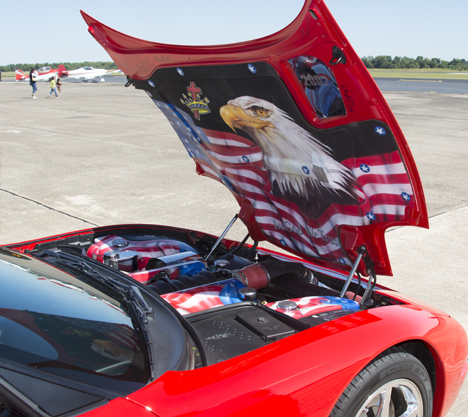 A fine piece of patriotic art adorns the engine compartment of a late model Corvette at the show. Sa-lute! See more pictures of this event in our Wings and Wheels gallery. Forty-five pix in all from this event. The annual Wings and Wheels Fly-in is a shining example the good that comes from people who don’t mind volunteering sweat and putting their money where their mouth is. Our congratulations to the Razorback Chapter of the Experimental Aircraft Association for a fine community event. Great job! The barn in the curve south of Mountain View, Arkansas is a harbinger of things to come. Click on the barn to see our original November 2011 post. Though living in the Delta for 50 years has all but altered my genetic code, there are yet some lingering threads of mountain DNA struggling to influence my appreciation for higher country. These lofty threads were winning the battle the last week of November 2011 as we returned to the Delta from a Thanksgiving gathering in Mountain View, Arkansas. As I approached a gravel road I had traveled before, the urge to turn overwhelmed the urge to go straight. Frequently following these urges bears visual fruit and prosaic ammunition. Check out our original December 4, 2011 Weekly Grist post and see the details, including the cat below. Down the road, catching a few rays next to a crumbling country house, we found a big ol’ cat with blue eyes. Since the cat showed come calico, we know it was a she. She was curious, but wary. Wanted to see us. But did not want us to touch or get too close. I suppose that’s why she has grown and survived. See a picture of her majesty and the old house she calls home on the Photo of the Week Page at Corndancer.com. Had I given up on the trip, I would have missed these two. Click on the pups to see our original story. Back on May 14 of 2011, I sallied forth on a trip to find a suitable set of visual and prosaic circumstances which would result in another edition of Weekly Grist for the Eyes and Mind. I stumbled across a few decent photo opportunities, but none with an opportunity to expound as part of the deal. I was close to throwing in the towel when I happened across an old homestead. Not long after I arrived, a family member showed up. She willingly provided information and a “license to shoot.” Game on. See our original Weekly Grist post and see what we saw. The old home place was a great target clearly demonstrating the country charm of wear and tear. For the four-fold Amen, a couple of cute puppies made the scene. Not too shabby for a day I upon which I had nearly given up. The adage, “don’t give up before the miracle happens,” could not have been more true. That is also a good hint to check out the original Corndancer Photo of the Week story for more pictures and the original story. To whet your appetite for our original Weekly Grist post and Corndancer Story, here are side and back views of the old home. Side view of the old home. Click on it to see the original Corndancer story and pictures. The back side of the hold house. Click on it to see our original Weekly Grist post for more pix and stories. Here’s hoping you find this digression worthwhile. Thanks for looking. 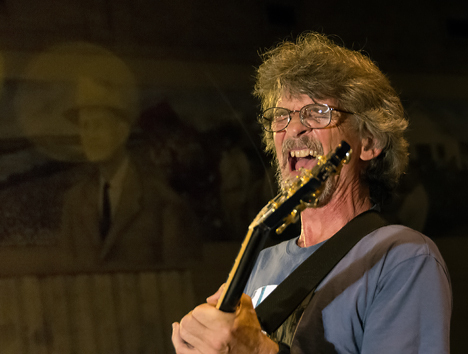 The guitarist for the Brooks Family Band performing at Music on Main in Pine Bluff, Arkansas shows unbridled enthusiasm and neck popping emotion during the concert. Though the look is menacing, he is a man of good humor putting on a good performance. In the background, the image of John Rust, a legendary inventor and manufacturer of agricultural equipment, looks on from a mural. 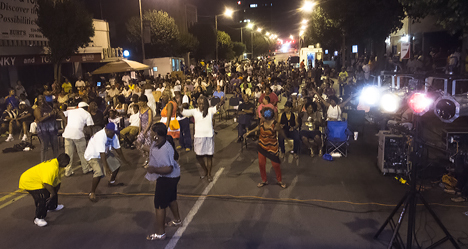 The evening of August 30, 2013, four bands entertained an appreciative audience at Music on Main in Pine Bluff, Arkansas. Despite prognostications of oppressive heat and humidity, conditions were moderate. The music was anything but moderate. Excellent musicians fed an appreciative audience what they came for: fine entertainment in a friendly outdoor environment. Click on the drummer for more pix and a story of the concert. 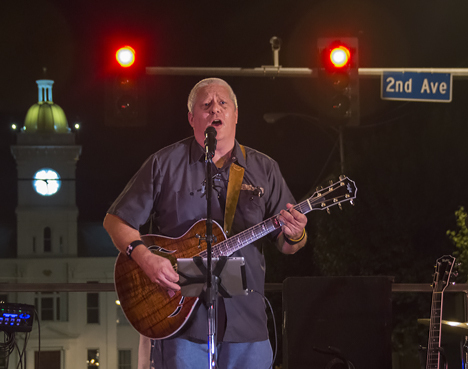 If you appreciate being surrounded by like minded individuals, enjoy foot tapping, and savor the aroma of barbeque while listening to live music, this was the place to be on that evening. Call it musical magnetic glue, a special attraction and connection. If you felt like leaving your chair to show your moves to the music, that was OK too. You can get more information and see more pictures of the concert and the audience on the Photo of the Week Page at Corndancer dot-com. Dave Sadler, a local architect was next up after the Brooks Family Band. During the week, he follows the path of Frank Lloyd Wright. On weekends, he leans toward Buddy Guy and Evel Knieval as he rides a Harley Davidson and plays — and sings some fine blues. Not simultaneously. I shot the concert from my seat and on foot as I wandered around the site. After one such wandering, I returned to find the young lady above in my seat. I politely asked her to move and she politely moved with a smile. As a reward for exemplary behavior, I held my camera for her while she put her eye to the viewfinder and clicked off a few exposures. Her brother wanted in on the action, so I did the same for him. I discovered later that these younguns are the grandchildren of a friend and former co-worker. Small world. No concert is complete without attendant phone photographers and videographers. In this case, there’s an old dog doing a new trick. I know the feeling. 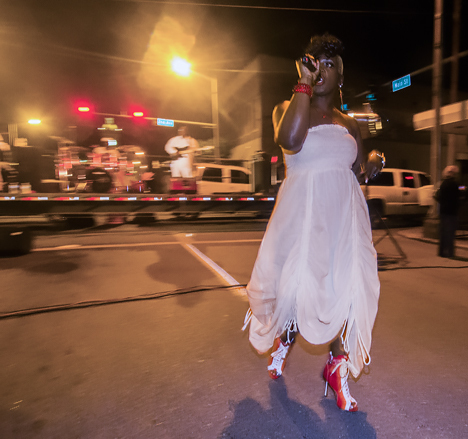 This singer left her three-piece band on the trailer and joined the audience. She was energetic with lyrics, tunes, and rhythm. She moved among the audience and invited them to “get on their feet.” They accepted the invitation. Get a load of audience participation from our street singer. She encouraged ’em to shake their respective booties, and shake ’em they did. Fun times! When your feet are tapping and you are enjoying music and the atmosphere it creates, differences melt like an iceberg at the Equator. The trick is to take the results of the moment with you. So far, so good. Let the good times roll. Some more. See 55 more pictures of the event in our Music on Main Gallery.